Propelled from the industrial Northeast to the tropical climate of South Florida, FURY is a highenergy version of the working-class ethnic prevelant in the blue collar areas of Pennsylvania and New York. FURY's current success can be attributed to a steady maintenance of their musical and visual energy levels; As a result, FURY is the most exciting and sought after act in South Florida today. "FURY is Steve Weiss - lead guitar, Ken Wendland - percussion, Greg Westmoreland - keyboards, and Tim Lewis - bass. Each band sings lead as well, spotlighting four distinctive, yet harmonious vocal styles. And each has had recording experience. FURY's members are as comfortable in the studio as they are on stage. Steve, Ken, and Tim formed FURYin February 1983, in time for an April Fool's Day debut that same year. Each had performed in various successful Pennsylvania and New Jersey club acts prior to their coming together in FURY. They quickly established themselves in that circuit with a distinctive mix of danceable rock and slick visuals. With the addition of Greg in December of 1983, FURY's line up was complete. FURY was now poised on the threshold of success, waiting only for that one big break. That big break came four months later when FURY was booked into Fort Lauderdale, Florida for Spring Break, that time of year when the area becomes the mecca for party-bound college students from allover the U.S. FURY took this crowd by storm, appearing before packed houses nightly. It was here that FURY laid the foundation for their soon-to-be-achieved success through simple hard work. Their resort-town popularity made FURY a natural for another famous beach that summer. The Penalty Box, Wildwood, NJ's largest venue, selected FURY to headline the 1984 season. In a short time, FURY became the talk of the famous Pacific Avenue strip with their eyepopping visuals and musical energy. It was here that FURY first caught wind of the national music scene, opening for such recording acts as the Outlaws and Greg Allman. In an effort to reach their recording aspirations, FURY decided to make South Florida their base in September 1984. Thanks to their popularity there they could perform six nights a week to pay the bills while still keeping the days open for work on their originals. It was at this time that FURY was introduced to veteran Philly producer Gary A. King who liked what he heard and began to work with the band on their originals. King, noted for his work with such new artists as the Hooters and Brickland, was behind the board during FURY's sessions in Miami Quadradial Sound Studios in July, 1985. Quadradial is home for such artists as Ted Nugent, Pat Travers, and Rick Springfield. 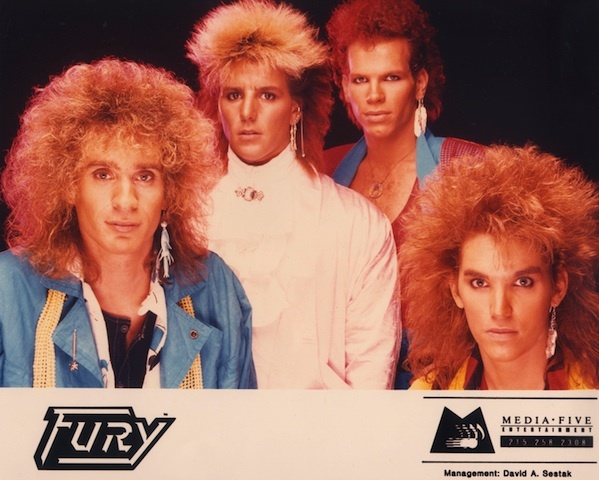 In response to record company interest, FURY recorded their three strongest tunes for their debut, ""Don't Say,"" ""Waiting for Love,"" and ""The Night."" All through their recording effort, FURY remained as hot as ever on stage, packing them in all over the Sunshine State. The first anniversary of their move to Florida was marked by a giant show co-produced by one of South Florida's most famous venues, Summers on the Beach, and radio station WSHE-FM, Fort Lauderdale. FURY debuted their original material to strong critical and popular reviews. Also during this time, FURY was chosen to open for such recording acts as: Lone Justice, John Parr, Jason and the Scorchers, and the Robin Trower Busboys. We're looking for former band members who can provide information to build this page. If you were a member of this band, please contact us at archive@mediafiveent.com or send us pertinent information and pictures, videos or mp3s of your band. Accepted materials and verified information will be posted."